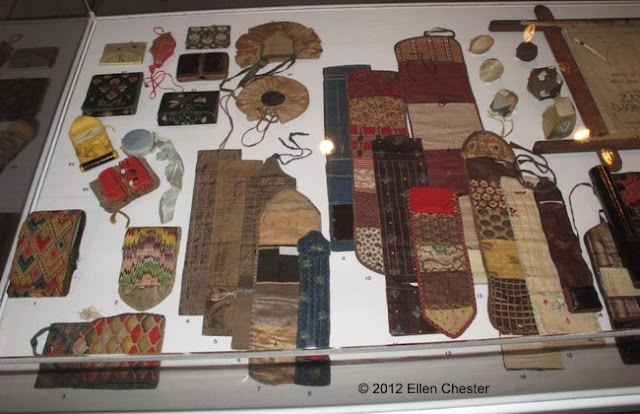 With My Needle: Huswifs, Pinballs, and Samplers--Oh My!! Huswifs, Pinballs, and Samplers--Oh My!! 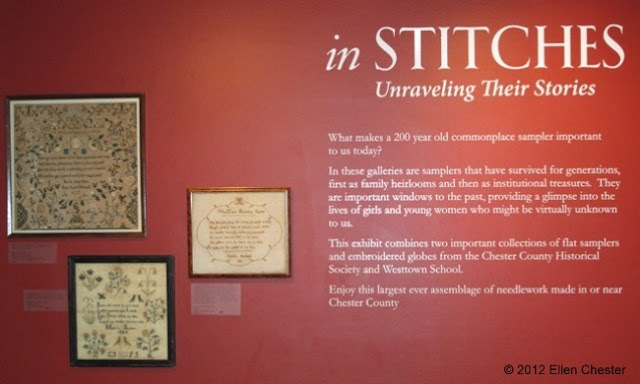 I recently visited the incredible needlework exhibit at the Chester County Historical Society Museum. 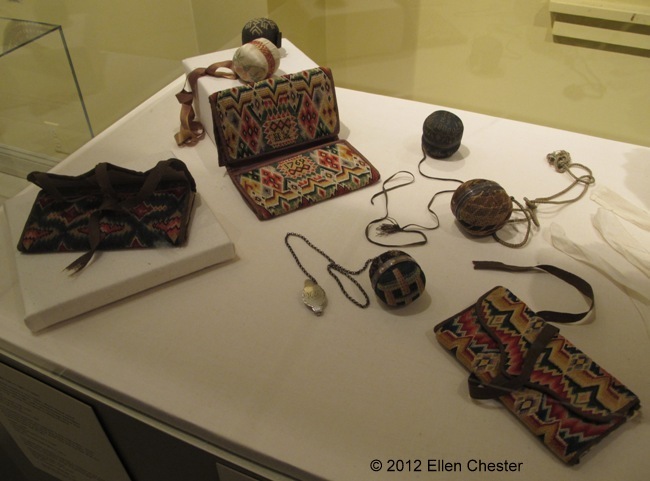 This exhibit features over 150 samplers and other items such as huswifs, pinballs, wallets, embroidered globes, and sewing cases. 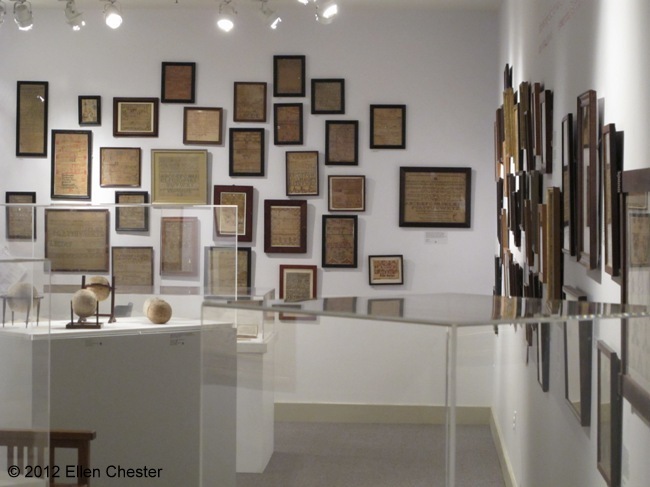 These items are part of the collections of the Chester County Historical Society and Westtown School. Personal photos are allowed. When I asked about using photos on my blog or in my newsletter, I was granted permission as long as the photos I post are not of individual pieces but rather of rooms and displays. I hope you'll enjoy these photos and that they will whet your appetite to go to West Chester, Pennsylvania, before the exhibit closes on September 7, 2012. 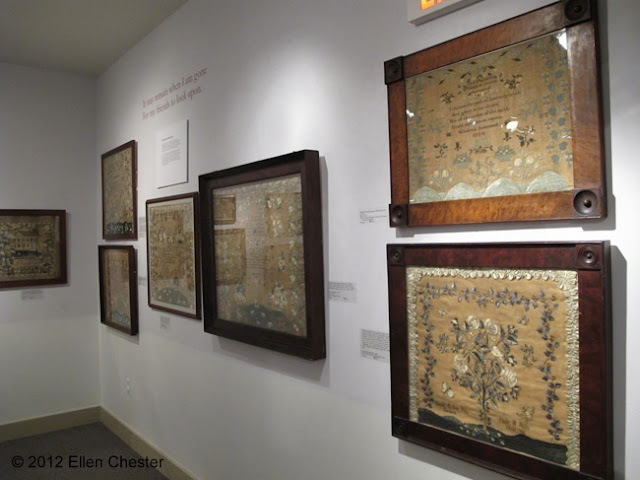 I was excited to see the Deborah Walker sampler (from The Chester County Historical Society) and the Rachel Ellis sampler (from Westtown School) because I have stitched reproductions of both. I hope these photos give you a glimpse into this marvelous exhibit. 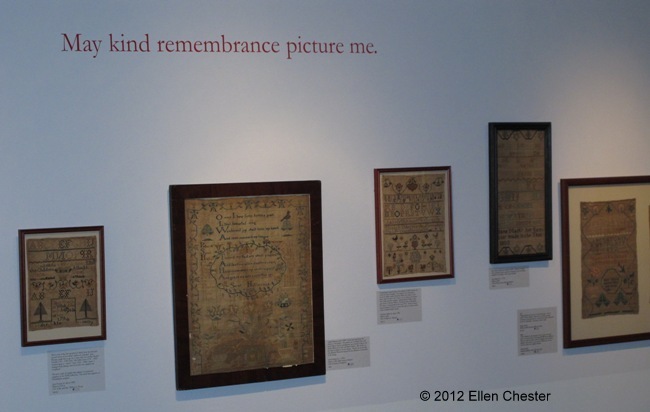 What a beautiful exibit you are so lucky to have seen this lovely display. I see a trip in my near future! 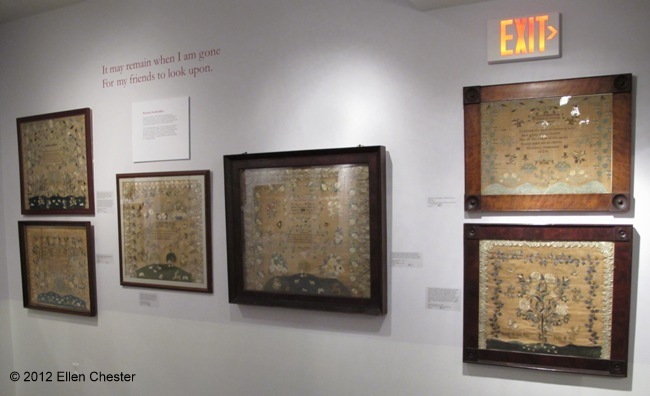 What great fun to see the original of not one, but two of the samplers you've stitched. How exciting!!! 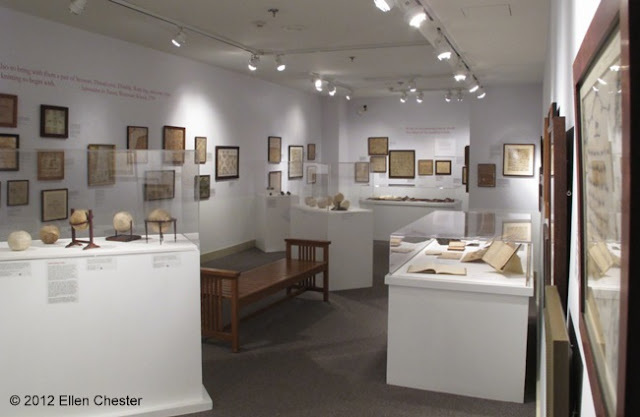 Oh my goodness, what a fabulous exhibit. How lucky you are to get to go!! Thank you for sharing the pictures with us! What a wonderful exhibit and thank you so much for sharing it. I'm so sorry I've been gone for so long but some people left a very nasty taste in my mouth and I have only just started stitching again after nearly two years. But I still have what I won from you and as soon as I have finished stitching my exchange piece one of yours will be next on my list. Thank you so much for everything. Oh wow! I need to go to that exhibit! I need to find an excuse to go to that part of PA though. lol! Beautiful! Thanks for sharing pictures. I'm drooling! Oh my! What a treat to see these photos. How awesome it must have been to have seen these in person! Such a beautiful display of samplers! These must have been amazing to see in person. Thank you for sharing them Ellen. What an amazing collection!Thank you so much for sharing the photos with us! Amazing! What a beautiful exhibit! 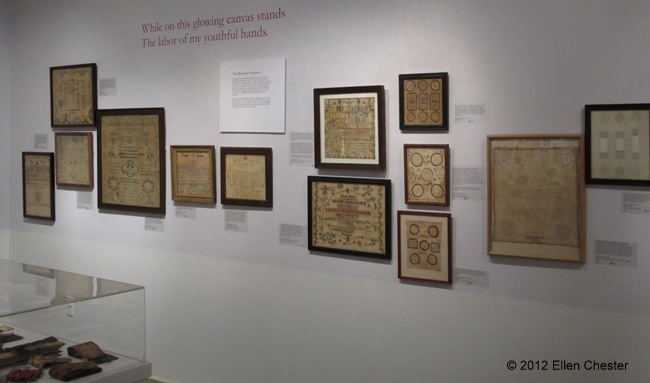 I could spend hours there looking at all those wonderful samplers. Thank you so much for sharing them with us. Wonderful - and thank you for sharing! 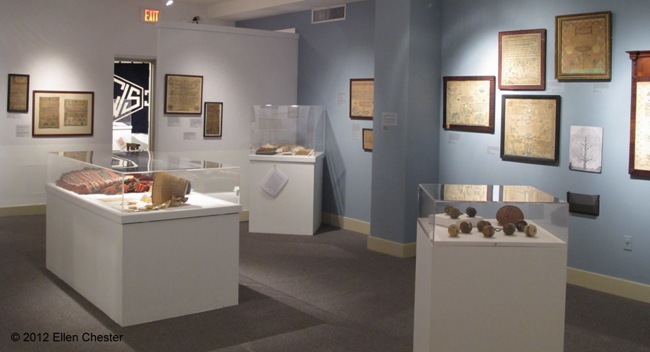 Wow, what an amazing exhibit! Thank you for sharing!